The internet is not just another telecommunications service - it represents the idea that we can create our own solutions. also know as the telephone. Then we moved beyond wires with radio and television broadcasting, and with cellular telephony, we gained mobility. But the basic business model of telecommunications is the same - the operators provide services using their own infrastructure. They use the revenue from selling these services to fund their infrastructure. Then one day, the internet happened, and everything changed. Well, not exactly. The change had been brewing for a while as we became adept at fashioning our own solutions. 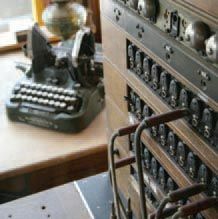 In the days of analog networking you needed a special infrastructure for each medium in order to preserve the signal - carrying a phone call across the country or across an ocean was an impressive engineering feat. The telephone companies invested in research and developed digital technologies. Unlike analog technologies, you could regenerate a digital signal over any distance. At first, "digital" was seen as a technology for the carriers to use to improve their ability to provide their traditional services. In the 1960s and '70s we started to connect computers directly to each other using wires and sometimes radios. As long as the systems were close together, we didn't need to buy telecommunications services. We could just send digital packets between systems. If a packet got lost or garbled, the software would just resend it until we had the complete message. This was the essential idea behind Ethernet. We considered it all to be networking, but it was no more like telecommunication's notion of networking than driving a car is like taking the train. The defining concept of the internet is the "end-to-end" principle - we can create our own reliable solutions even over an unreliable network. We need to be careful to avoid confusing "end-to-end" with "womb-to-tomb." The latter term assumes someone is making sure that everything works, whereas end-to-end means we are concerned only with the endpoints, and not an operator's network services. operator to provide services, thus we had to discover what worked and what didn't. This end-to-end constraint is what has given the internet its strength. By disallowing such dependencies, we've grown stronger. We had to wait for the internet to grow in order to be able to do voice over IP (VoIP), but today it's just another service with cost above the raw cost of the bits. We're now at the point where we can pretty much assume that we can make an internet connection between any two points and expect it to work. We're ready to visit the internet and take advantage of end-to-end connectivity. As tourists we needn't be aware that today's internet is only a prototype, and we are likely to confuse the internet with telecom. After all, a VoIP connection acts just like a phone call, so isn't it the same? Yet even as tourists, we've discovered the possibilities of the web and created peer-to-peer applications. And we accepted that applications only worked if we also made sure we had a billing relationship with all providers along the path. This is the "broadband" model. We discovered that broadband is good for video. It's a testament to the power of the endto- end principle that we've been able to rediscover that broadband is good for video. But it's also a testament to our confusion that we haven't been more frustrated by what we cannot do (like medical monitoring) because we can't always presume even a low-speed connection away from home. As visitors, we embrace the web and create our own sites. We expect everyone to have email and build applications that take advantage of messaging. We can deploy services using software and host it on our own site or at a customer's site. We can maintain and update applications even after we deliver them. Yet, for most people, the internet is still just the "e" version of the familiar. We e-shop at the e-mall, and we exchange email. "VoIP" is just another phone service. As visitors, we treat the internet as simply "the network," and we are starting to build applications that call it home. We're starting to use "cloud" services so that our information and even home computers are available everywhere. We're starting to watch YouTube and expect broadcast television to be available on or over the 'net, but it's still television. But then, many of us are still at the stage where we think of the car as a horseless carriage. Lately, we've been starting to venture out a little, but we're not quite at the point where we wonder why a mobile device still called a "phone," when telephony is just another application. It's no surprise that we still think in terms of telephones and television because that's all we know from traditional telecom. We still don't treat our mobile devices as our digital agents who help us negotiate our way through an increasingly connected world. In fact, we still think of the internet in terms of computing devices and not as the basic infrastructure behind everyday objects such as light switches and traffic lights. But slowly we are starting to realize that the internet allows us to focus on the relationships between two end points, be they people or devices. We assume we can exchange messages between the endpoints while being resilient when we can't connect. We look for nascent ideas like Amazon's Kindle, where the contents of a book are simply "available." Today's internet is indeed a prototype - like a bicycle with training wheels. We can apply the end-to-end principle in creating solutions. We plug devices into the hotel's internet connection and wonder why it doesn't work until we realize that we're up against those who equate the internet with "the web," and require us to use a browser to make the connection as if we were placing a phone call. When we rearrange the furniture in our houses, we may start to wonder why we can't simply move the light switch by simply redefining its relationship with the light. After all, why should you define the relationship by the wires in the house any more than you depend on a dedicated wire between your PC and a web site? For that matter, why is the internet something you access with your PC or "mobile"? Shouldn't it simply be available anywhere with or without a wire? After all, bits don't care whether they are wired or wire- less. They are just bits. We may ask why you need so many remote controls in your house rather than just having open protocols and your own controller. We recognize that today's protocols are just a first attempt, and that the IP address provides neither a stable identifier nor stable routing. We architect products to work around these limitations, while maintaining the high-level model of simple end-to-end relationships. As digital natives, we recognize that relationships don't depend on any particular path. We see some of this in Skype, which maintains a list of your relationships and tries to find a path even as you move around. We no longer need a provider, but instead create our own solutions. If it's about relationships, then we shouldn't be required to pay service providers. But today our infrastructure is controlled by carriers acting as gatekeepers, who force us to buy services to fund their infrastructure, just as they did a century ago. Being a digital native can be a very frustrating experience because you are leaving behind old paradigms. You no longer think of the internet as a replacement for telecom, but as a new way to think about building systems and creating solutions. And you will be frustrated because even something as simple as having your physician monitor your health while traveling doesn't "just work." You have to first assure that there is a billing relationship with every carrier in the path. Today, if you buy an Amazon Kindle (its wireless "electronic paper" reading device), you simply press "buy" and the book appears on the device because Amazon had to negotiate a special deal, and even that works only near Sprint cellular sites. You no longer think about doing everything "on the internet," but instead try to take advantage of connected relationships. And then you look all around you, and you find you're still living in a 20th century world ruled by phone companies. You're stuck with "plug boards" because the means of transmission (i.e., the cables) are owned by someone who demands a cut of the action.